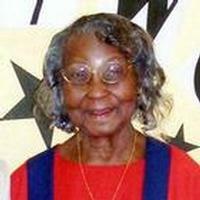 Sister Mozell "Tuda" Davis Browning was born on December 25, 1916 to the late Duncan and Savannah(Jones)Davis. She was the seventh child born to this union and the last living of the 8 children. She completed her journey when her immortal spirit soared to its resting place on Saturday, June 15, 2013, at Courtyard Gardens Health and Rehabilitation in Arkadelphia, AR. Sister Browning accepted Christ at a young age at Piney Grove African Methodist Episcopal Church. She was a faithful member who served as the President of the Stewardess Board for many years, member of the Zenobia Jones Women's Missionary Society, a class leader, and Co-head of the culinary committee until her health failed. Sister Browning married the handsome and loving Nazaree Browning, Sr., The Lord blessed this union with eight children, four of whom proceeds her in death, Lillie Ann, Jimmy, John Dean and Jerry Browning(April 26, 2012). Sister Browning worked for the Arkadelphia Human Development Center in Arkadelphia where she retired. She joined the OBU Foster Grandparent program where she worked with Perritt Primary School, the principal, as well as other faculty remembered her as dependable and hard working. Sister Browning was not only involved in her church but also in her community. She was also quick to help others when called upon. She was a happy, outspoken, fun-spirited woman who lit up a room when she walked in. The life of Sister Mozell Davis Browning will forever be in our hearts. She leaves to cherish and honor her life long memories, four children: Robert(Delores)Browning of St. Louis, MO, Nazaree(Jacqueline)Browning of Detroit, MI, Larry(Pamela)Browning of Clinton, MD, and Ronnie(Jeanette)Browning of Arkadelphia, AR; one step-daughter Juanita Reed of Arkadelphia, AR; one daughter-in-law, Charlotte Browning, Arkadelphia, AR; special niece and friend Emma Jean Garland. She leaves 15 grandchildren, 12 great-grandchildren, and 5 great-great grandchildren as well as a host of nieces, nephews, cousins, relatives, numerous friends and the Piney Groves A.M.E. Church family. Funeral service will be Saturday June 22 at 11 A.M. at the St. Paul A.M.E. Church with Rev. T.W. Scott is Pastor and Rev. Curtis O. Dansby officiating. Burial will be in Piney Grove cemetery. Visitation will be at the funeral home Friday June 21 from 12 to 7 p.m. with family hour from 6 to 7 p.m. Mitchell Funeral Home Directing.